I had a lovely day today with Pam. There will be a number of blog posts about the day. Upon arriving home, I dealt with a load of laundry and decided the sewing machine will fit better on the table in the living room. I have much more natural light than in the kitchen as well as much more room to spread out fabric and pieces. So, I spent part of the afternoon making that table machine ready. That involved paying bills, sorting and moving the cookbooks I've had there for months to the kitchen table. If I ever have a place where tables aren't used for storage, I don't know what I'll do. 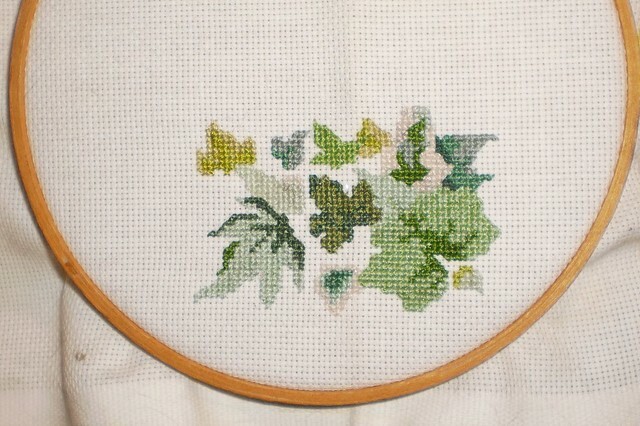 After that was done, I decided I wanted to stitch. Two more leaves were added to the design. It's coming along nicely. Sitting also means ear scratching and lap warming. 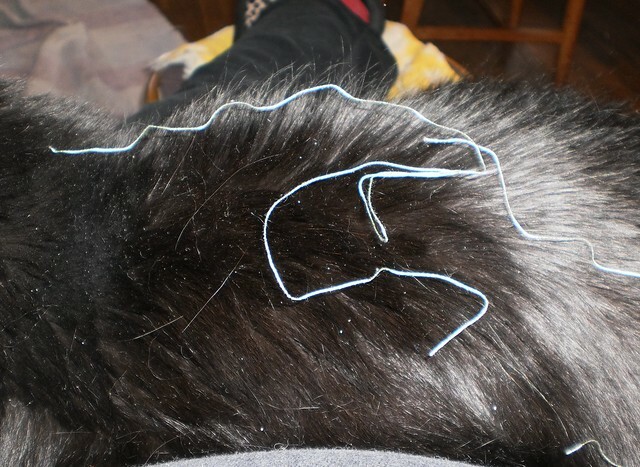 Pilchard is a good sport because, when I sew, I need a place to set the cut strands of floss when I'm changing colors. She didn't like it at first but she's accepted that as long as she wants ear scratches and I'm stitching, she has to put up with being the place the thread is set. It's really a light mint green and not light blue.